Miller Williams was an American poet who produced over 25 books and won many awards. He read a poem at the second inauguration of Bill Clinton. Clinton presented Williams with the National Arts Award. Today's poem is about the art of writing. 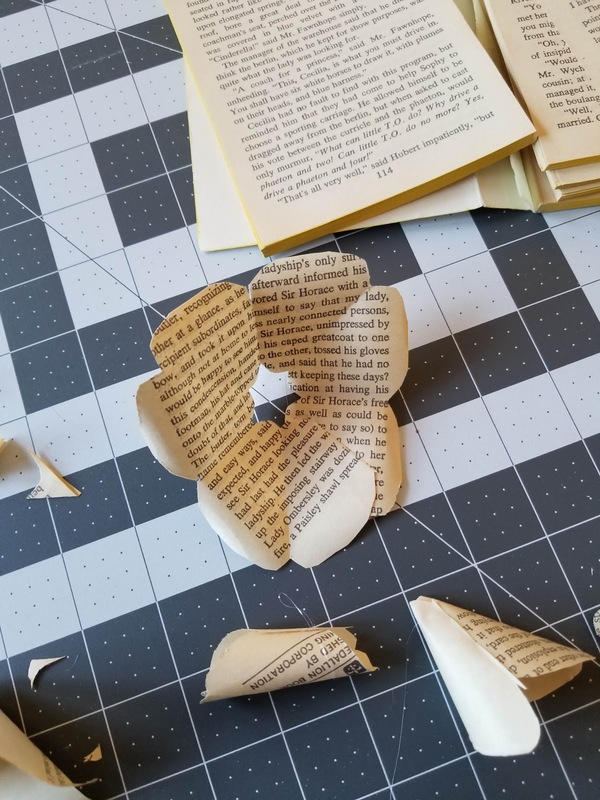 I don't like crafts that require you to destroy a book. It just feels wrong. No matter how boring or unnecessary a book may be I can't rip it apart. 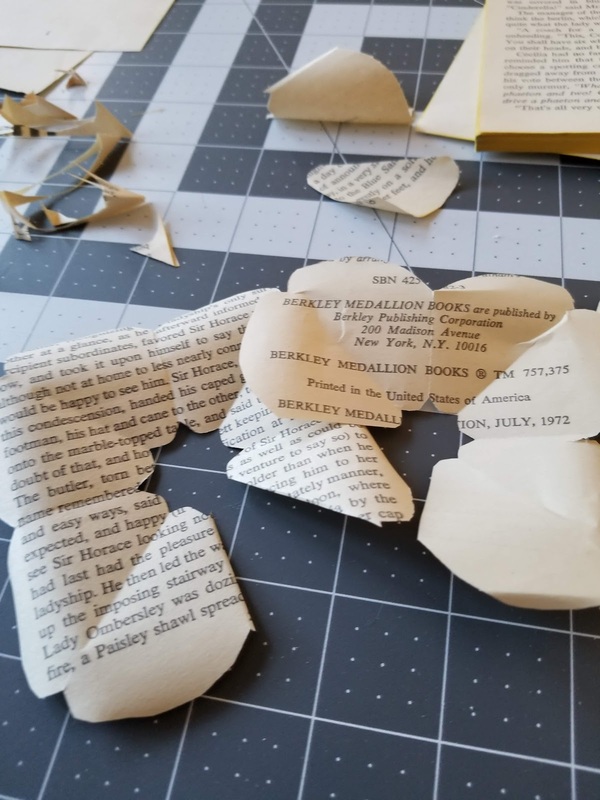 However, if a book falls apart on its own it is fair game. I bought this copy of a Georgette Heyer novel online and each page fell out as I turned it. 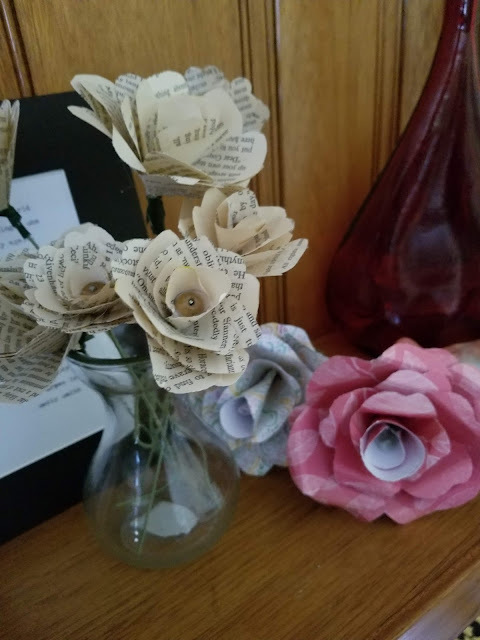 While that was irritating, it did give me the chance to try making paper roses. I had seen them on Etsy and loved them but didn't want to spend money on them because I am...frugal. You can find tutorials for basically everything these days so, after a bit of puttering around online and the purchase of a hot glue gun, my daughter and I were ready to experiment. They were amazingly easy to make and it is very satisfying. 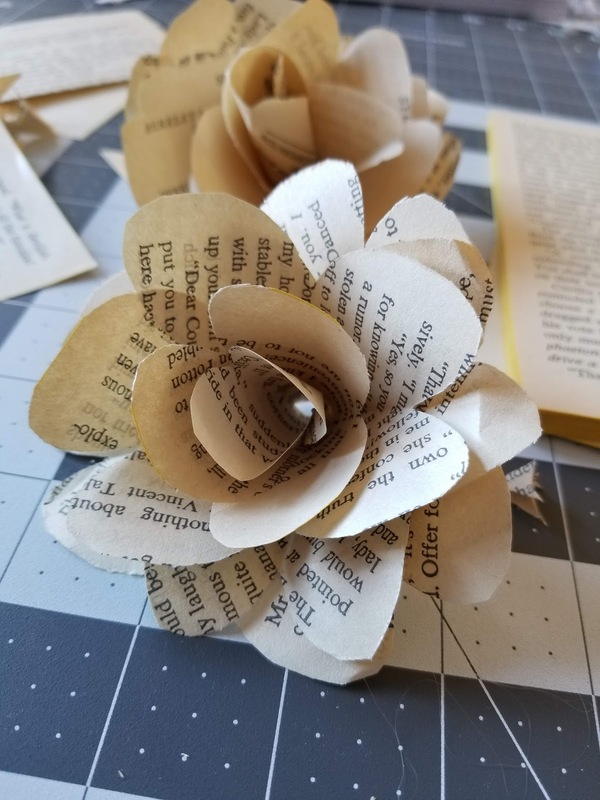 I think I have mentioned before that I am not naturally artistic or crafty so I am always pleasantly surprised when things turn out the way they are supposed to. I made a bouquet for the mantel and will probably add a few more flowers to it when I have a free evening. Celia calls it my "book-quet." I bought a pad of thick scrapbooking paper and that made very pretty flowers as well. 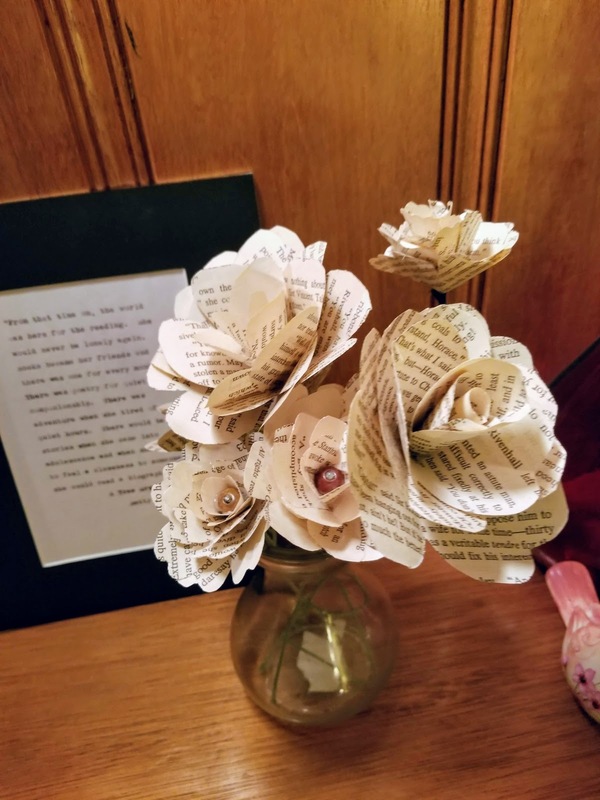 Just how many paper roses does one house need? 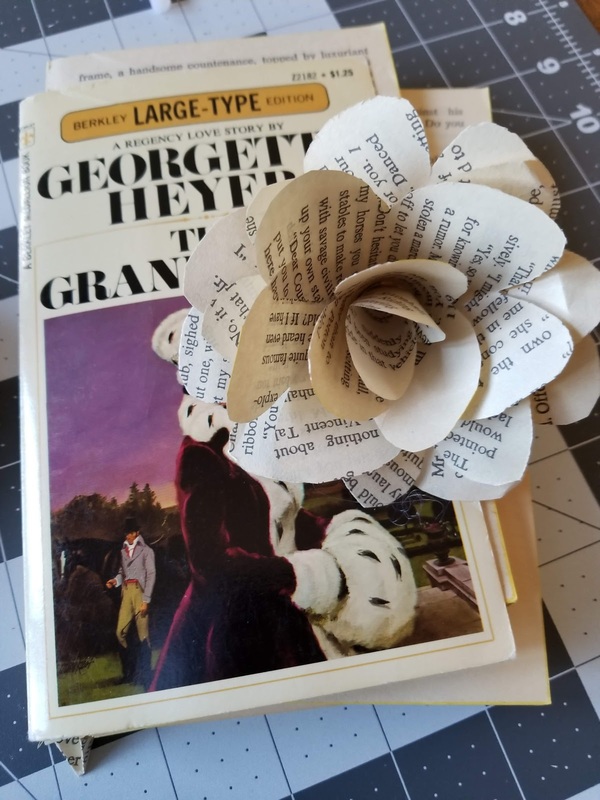 I still have lots of pages of the Heyer novel left and I have a Little House book that has fallen apart. I found a tutorial on how to decoupage a kitchen table. I'm tempted. James Wright was born in Martins Ferry, Ohio, in 1927. He fought in WWII. He returned home, attended college, and then went to Austria on a Fulbright Fellowship. His early poems were conventional but his work became looser in style as time went on. He won the Pulitzer Prize for poetry in 1972. An article in The New York Times says that while "the mood of the poet was sometimes very dark,...one of his great strengths...was the life-affirming quality of his work." Interestingly, James Wright's son was also a poet and he also won the Pulitzer Prize. They are the only father/son duo to do so. Where they have been grazing all day alone. They bow shyly as wet swans. They love one another. 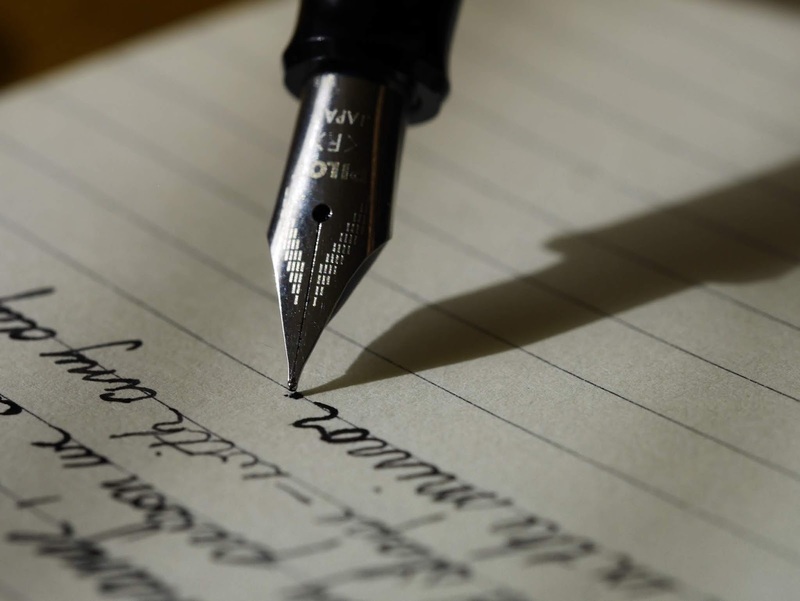 Visit Brona's Books for another poem. Reese at Typings has joined in for the first time this week. At any given moment, I have a stack of books piled on and next to the couch, my bed, or any available flat surface. They are books I am currently reading, books I have finished, books I want to read. Basically, my house is just covered in books. So, what books are near me right now? I recently finished Circus Shoes by Noel Streatfeild and it made me very happy. I read several of Streatfeild's books when I was a child but there were many I never came across and I feel like I missed out. I found this one for free on a donation shelf at the library and spent one glorious evening racing through it. I knew it was going to be good when Streatfeild eliminated the parents in the first paragraph. All adventurous books have to get rid of the parents. Peter and Santa were orphans. Their father and mother were killed in a railway accident when they were babies, so they came and lived with their aunt. The aunt's name was Rebecca Possit, but of course they called her Aunt Rebecca. Before the children were born Aunt Rebecca had been lady's maid to a duchess. 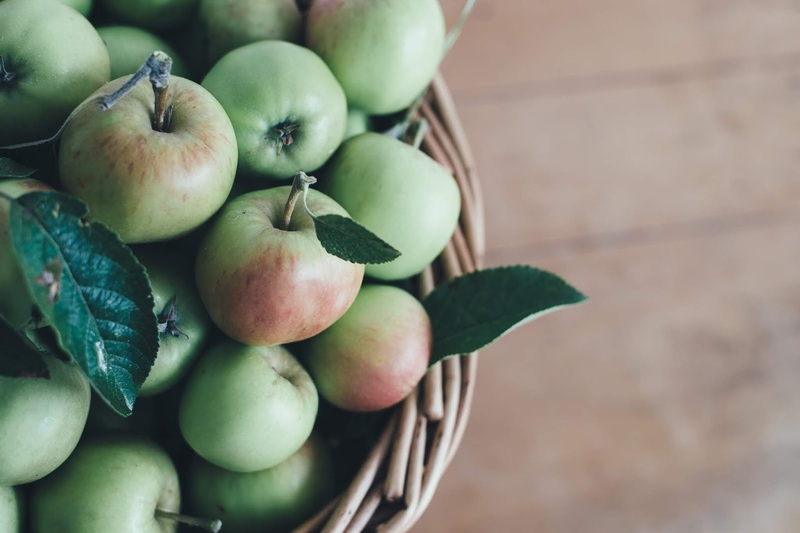 This was a good thing, because when the duchess died she left her an annuity, and, as Aunt Rebecca had no other money and neither had the children, it was important. You can probably see where this is going. Aunt Rebecca dies, the annuity dies with her, and the children are going to be sent to separate orphanages. They run away (of course) to join an unknown uncle who works with a circus (of course) and adventures commence. Did I mention they live in a caravan? Obviously, you need to read this right away. I am almost done reading Dearie: The Remarkable Life of Julia Child by Bob Spitz. This is also thoroughly enjoyable though in a completely different way. There are no circuses or caravans but there is a lot of food. Julia Child was quite the woman and very, very determined. I have one of her cookbooks and I need to pull it off the shelf and work my way through some of the recipes. I would definitely recommend this book but have lots of snacks on hand while you read it. I am also reading The Murrow Boys: Pioneers on the Front Lines of Broadcast Journalism by Stanley Cloud and Lynne Olson. I read Citizens of London by Lynne Olson a while ago and wanted to read more about Edward R. Murrow. So far, I am enjoying this. Lynne Olson makes history very accessible. Booknotes: America's Finest Authors on Reading, Writing, and the Power of Ideas by Brian Lamb is something I just picked up this morning. I read the first essay by David McCullough. I have read a couple of his history books. He said that he had always wanted to be a writer. 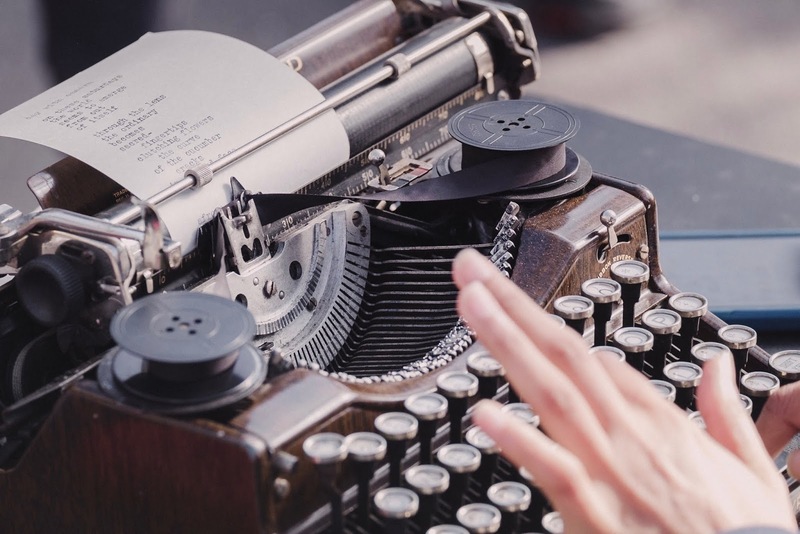 When I went to college, everybody was going to be a writer and I never dared talk about that. I never dared mention that. It seemed very presumptuous. But I secretly wanted to do that--to be that. When I saw the Catton book, I realized that history could be written about life. It could be written about human beings. It could be written about the feeling of places. It had all the narrative quality and the art of the written word about something that really happened. That was a revelation to me. I also have a couple of books of poetry that I have been flipping through looking for Thursday poems. 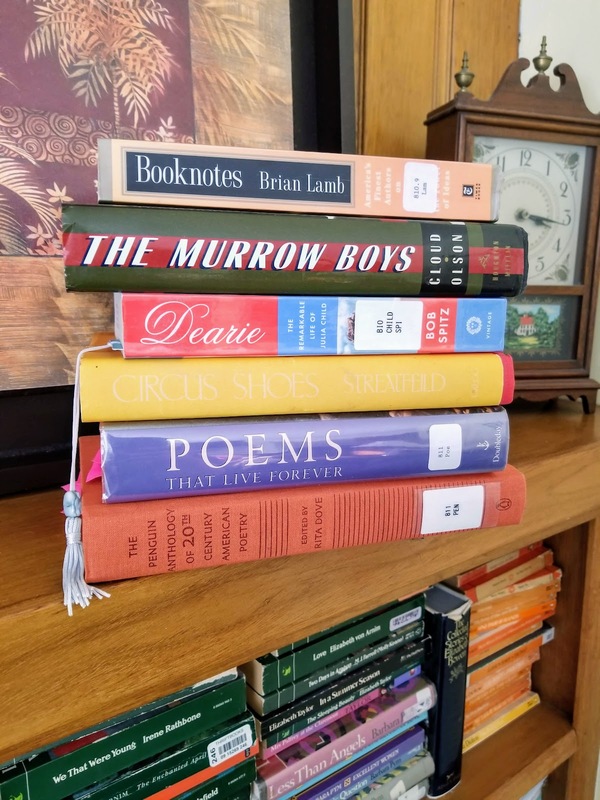 My library has a pitifully poor selection of poetry so I need to find some books somewhere else. However, for now, I have enough poems for a couple of months picked out. Richard Wilbur served in WWII, attended Harvard University, and then taught at Harvard, Wellesley Wesleyan University, and Smith College. He was the U.S. poet laureate in 1987 and 1988. I like anything about words and writing and I think this poem about his daughter writing a story is beautiful. To the hard floor or the desk-top. Visit Brona's Books and Pastry & Purls for more poems. I grew up going to Cape Cod for a week every summer. We loved it and spent weeks ahead of time thinking and planning. We always rented a cottage, usually at the same place, and we spent the week eating seafood, walking the National Seashore, collecting buckets of shells and rocks, and trying to convince our parents to visit tacky gift shops. The Cape has become more and more crowded over the years and I don't go back very often but it still holds a special place in my heart. When I smell the salt marshes and feel the sand between my toes, when I eat fried shrimp while sitting at a picnic table at a roadside clam shack, and when I watch the sunset at Rock Harbor I feel like I have returned to my childhood. I just finished My Own Cape Cod by Gladys Taber. My grandmother loaned me a book by Taber and I enjoyed it so I got this from the library yesterday and gobbled it down. 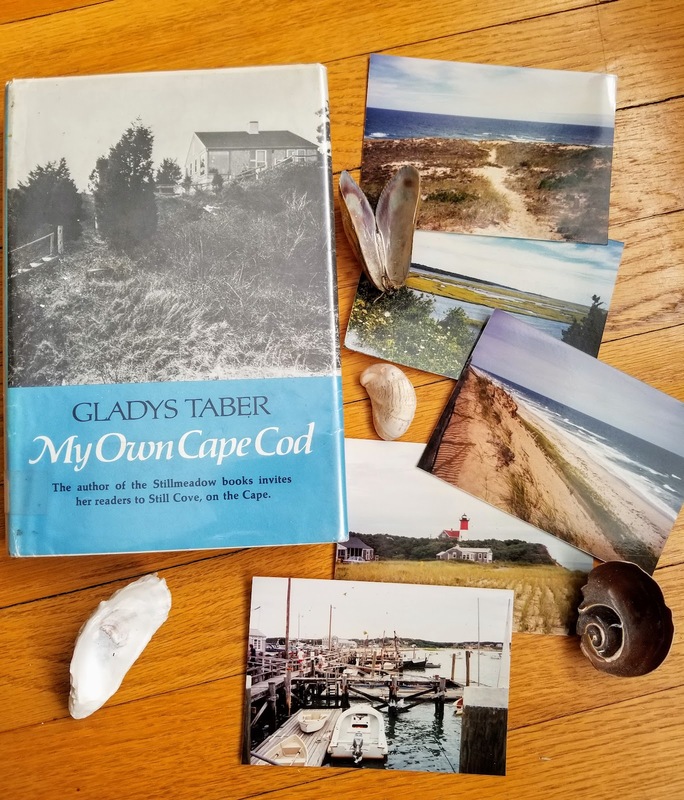 Taber owned a house on the Cape during the '60s and '70s and wrote lovingly about a Cape that existed just slightly before my time. She, too, watched the sunsets at Rock Harbor and visited First Encounter beach. She loved the beach roses as I do and she appreciated the special Cape Cod scenery. On the way to absorb a Rock Harbor sunset, I passed the beach plums along the meadow-edge of Rock Harbor Road. They were just coming into full bloom and they are the real music of May. The flowers are close-set on charcoal branches and the bushes themselves are graceful as a ballet dancer. The blooming is whiter than white until the end of it when the whole bush turns a soft Victorian shade of pink and then ebbs to cinnamon. The book reads as if you are having a gentle conversation with an old friend. She rants a bit about modern day life and how we are all being reduced to numbers. I wonder what she would think of our passwords and pins that we have to remember now. She mentions hippies and the Vietnam War but both of these are passing mentions. In general, you sink back into a nostalgic world where neighbors watch out for each other and no one locks their door. I mention this kind of thing every now and then as a part of the nervous strain of present-day livng. When I was child, I had one number to remember-7-our house was 7 Brokaw Place. Now, in nightmares, I find I have lost my social security number, my zip code, my bank identification number, and the ten digits that should go on the bottom of every dividend check. In a few years, children will be named Four and Five, like Beverley Nichols' cats. I can see it coming, even on Cape Cod! This was the perfect book to read on a cold, snowy day. It was gentle and peaceful and nostalgic. Her love for the Cape shines through the whole book. 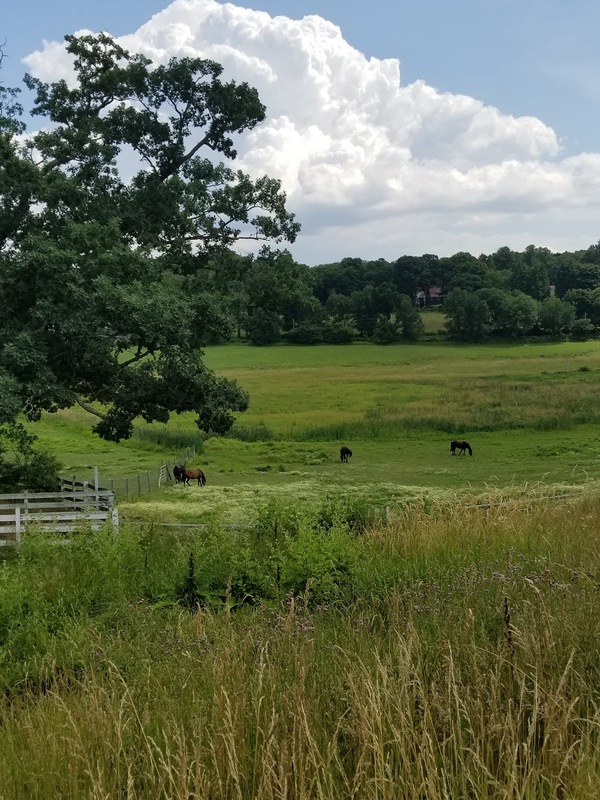 Many of her other books are about Stillmeadow, her farm in Connecticut. I live in Connecticut and greatly enjoy those as well. It is an amethyst glow at the horizon over Mill Pond, announcing dawn. It is the Full Flower Moon in May walking in gold on quiet water. It is intrepid fishermen setting out in small boats in wind and waves. It is the same boats rocking gently at anchor in the opal sunset harbor. Shadblow and beach plum in drifts of snow followed by wild wide-petaled roses on every slope, these are Cape Cod. John Drinkwater was an English poet and dramatist who lived from 1851-1923. He was associated with poets such as Rupert Brooke. He had great success with his play, Abraham Lincoln which premiered in England, was produced on Broadway, and then was turned into a film in 1924. I only came across a couple of his poems but I particularly liked this one. It is very visual in its descriptions.